There are two observations about using the N5005. First, make damn sure you are using the right tips, and don’t be afraid of making the jump to Comply or even experimenting well beyond the norm. With most earphones the difference between tips is a comfort issue, but here it’s the difference between a reasonably OK sounding earphone and ‘wow, that is the best earphone I have ever heard.’ Secondly, although the N5005 is more than efficient enough to be driven by the output of any phone that still has a headphone socket, don’t do it. This earphone demands quality, and quantity when it comes to amps. It’s deceptively demanding. Observe those two conditions and you are left with one of the best non-custom earphones money can buy. 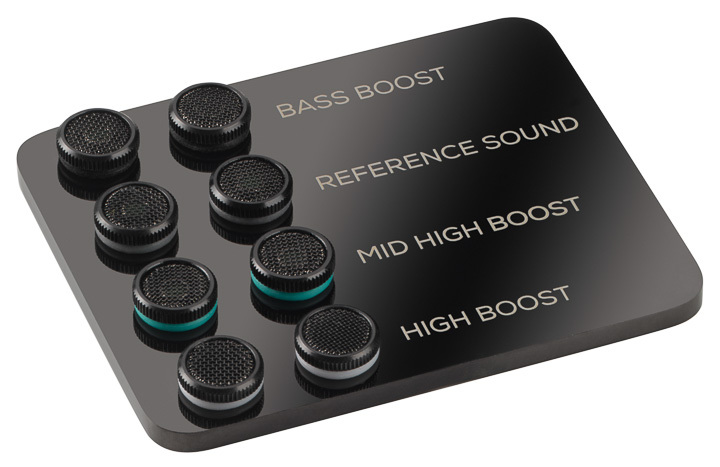 With the right seal from the correct tips, the bass is deep, authoritative, stentorian, and yet incredibly well controlled. And that’s without the bass boost. OK, so without the boost, the N5005 is more about clean depth and texture, and with the boost in place it’s more about weight and slam, but for most audio enthusiasts, the Reference filter has more than enough weight and also has the perfect balance. Midrange, meanwhile, is lithe and liquid regardless of filter. It’s incredibly detailed and insightful, with the kind of undistorted, accurate vocals that make it sound like you took two or three steps out of the recording process making you closer to the studio. This is ‘pure as the driven snow’ clean, and with a very pure female vocal, such as Feist singing ‘Mushaboom’ from her 2004 Let It Diealbum [Polydor], and you quickly get past the fact it was overplayed at the time and she unwittingly spawned a generation of breathy songstresses with meaningless cover versions. Instead, you hear into the vocals and enjoy the music as if new. The high frequencies start out a little forward, but soon run in. The Reference filter is, to my mind, the best balance here and it makes the most noticeable difference, but even the high boost filter doesn’t make the N5005 aggressive; rather, just brings back that forwardness. Otherwise, the N5005 has an effortless, almost valve-like tonality and insight into the treble. It’s extended way up into the bat-eared territory, but without harsheness, just with accuracy and honesty. This can be a double-edged sword with some more compressed and pinched-sounding recordings from the early part of this century, but even here I find that intrinsic honesty alluring, except with the most strident and compressed of sounds. In fairness, however, I find those albums (Metallica’s Death Magneticfor example) almost unlistenable no matter what system is being played, so while it doesn’t make a silk purse out of a sow’s ear, neither should the AKG N5005 be criticised for making a sow’s ear out of a sow’s ear! The overall imaging of the earphones is surprisingly good, given they are earphones and not electrostatic headphones or similar. There is always going to be a significant amount of lateralisation (projecting sounds inside your head instead of the space around you), but the effect is mitigated somewhat by the overarching sense of naturalness to the sound, which gives the listener the distinct impression they are not listening to an electronic device. As this was Proms season, I had the chance to listen to a live binaural recording on BBC Radio Three, and that really showed just how good the AKG N5005’s performance is in this soundstaging respect. It sounded uncannily like the real thing, and made me immediately wish for more dummy head recordings (I drank deep from the Chasing The Dragon catalogue as a result).